How Long Should RV Sewer Hose Be? How to Hard Pipe RV Sewer Line? RV Sewer Hookup Permanent – How? How to Hard Pipe RV Sewer? How to Hook Up RV Sewer At Home? Are you shopping around for the best RV sewer hose? What should you be looking for when buying one? And what makes a good choice for this recreational vehicle sewer hose? The use of the sewer hose kit is essential for the drainage in your rig because it flushes waste from your RV to a park or camping ground’s sewage system. With it, you can also have peace of mind of a leak-free operation and ease of use. But before buying one, you should check its length, diameter, thickness and other factors to ensure it could resist pinholes, punctures and scratches. You should also look for one with stability and made of durable materials for long lasting service. However, there are many sewer hose kits available on the market, so it is uneasy and complicated to pick one to suit your needs. For this reason, we’ve put up the guide that will help you decide on the best sewer hose kit that will assist you in emptying your tank with ease and convenience. Keep reading and find out more about ways to select the best sewer hose for your rig now. When shopping around for a sewer hose kit, you should look for one that comes with complete accessories to prevent having a hard time completing your task of installing the sewer hose kit in your RV. One of those I found valuable for this is the Camco RhinoFLEX, which includes a translucent elbow that has four sizes of dump station fitting and swivel fitting. I also liked that it is long at 20 feet, making it versatile to get to places without any hassles. I also appreciate that it is durable, being one of the sturdiest I found around. The sewer hose kit includes two pieces of collapsible hoses made with polyolefin material, which is then reinforced using steel wire. Another reason it is recommendable is it bayonet fittings, which include four prongs that allow for a tight and secure fit. When it comes to a sewer connection, this model includes a very reliable four-in-one adapter that can connect to different sizes of threaded sewer connection. For each end, there is also a storage cap for sanitation. When it comes to storage, I also noted that the Camco RhinoFLEX Hose Kit is easy to store because its fittings and hose can be compressed. And when you removed the adapter, you can easily store the hose in 4-in sq bumpers. One of the best sewer hose kits around is the Camco RhinoEXTREME for reasons. It is a top-rated product that includes all the things you need for a complete installation. This model includes 20ft sewer hose, storage caps, elbow with 4 in 1 dump station fitting, swivel fitting and a 20ft sewer hose. Another thing that makes the Camco RhinoEXTREME an ideal choice is its storage caps and reusable lock rings. In addition, the Camco sewer hose kit already has two 10-feet sections that come with pre-attached lug and swivel bayonet fittings. The Camco RhinoEXTREME hose is long lasting that it is resistant to rust or dent. You will also not have to worry that it will rust or dent when someone stepped on it accidentally. This product won’t crush and is resistant to pinholes and abrasion, giving you the most value for your money. I would like to recommend this model because of its TPE technology, protecting the hose from pinholes and ensuring long-lasting use. One more thing I liked is that it is made of sturdy materials that ensure crush protection and abrasion resistance. The 4-in-1 dump station fitting is versatile to handle different applications. Are you looking for an everything-you-need sewer hose kit? When it comes to a black water hose kit, you should look for one that comes with all the things you need – and one of those that Camco RhinoFLEX 39770. The Camco RhinoFLEX 39770 includes the sturdiest hose on the market now, making it a top rater in reviews, social media and forums. I also noticed that it is a collapsible hose that can be extended to the length you need, and it makes storage easy, too. The manufacturer also designed it perfectly to have the perfect fit for its bayonet fitting that includes four prongs. This product is also made of steel wire reinforced polyolefin material that makes it a very durable hose that withstands heavy abuse and use. The sewer hose kit has fittings swivel, which also boast reusable lock rings so that you can move the fittings to another hose easily. I could also see that this kit can compress to 56 inches for quick storage. It also has a removable adapter that adds to ease of storage. Are you looking for a complete RV dump hose kit? The Valterra D04-0275 might just be what you’re searching for because it already has all those accessories and parts you need in order to use it right away. This model comes with two pieces of 10 feet hoses each with rotating fittings. I also noticed that the kit already comes with a universal sewer adapter for ease of use. 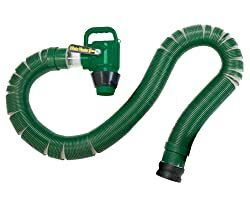 In addition, the Valterra D04-0275 is also a collapsible type of hose that makes it easy to store. The Valterra D04-0275 is also remarkable because it is thick enough at 23 mils, ensuring proper flow and prevents against pinholes and crush in case a car or something heavy stepped on it. This model is a 20ft sewer hose kit (2 x 10 feet hose). It has rotating fittings, which make it easy to use when it comes to draining the RV sewer. You will also appreciate that it comes with a 90-degree sewer adapter that also adds to the convenience of use of the Valterra kit. Once installed, you don’t have to worry about the hoses losing their shape once installed. They are extra thick and made of sturdy materials that also prevent leaks. Thanks to the UV stabilized poly construction of the Valterra D04-0275. You will also don’t have to worry about its flexibility because this one can stay flexible by up to -30-degree Fahrenheit. So when it comes to durability, flexibility and performance, there is nothing to ask from the Valterra D04-0275. The Camco RhinoFLEX 39764 extension hose kit is one of the best around if you need an extension hose for your RV sewer draining. So whenever you’re located far away from the dump station, you can rely on the Camco RhinoFLEX 39764 to help. If you’re looking to extend your sewer hose, you can make use of the 10 feet extension hose that already includes bayonet and lug fitting, which also has locking rings. It also has fittings swivel that is also detachable and convenient to use. You can also compress the hose to 39 inches. This length includes the fittings, allowing for quick and easy storage. In addition, I liked that it can fit into a four-inch square bumper, adding to the quick storage of the extension hose. The Camco 39764 is a standard at 23mils, keeping it durable and preventing crushes and pinholes. This product is also made of sturdy polyolefin material, one of the toughest materials for sewer hoses around. And adding to its durability, the hose is also reinforced with a steel wire. The Lippert 359724 is another top choice when it comes to RV sewer hoses on the market. 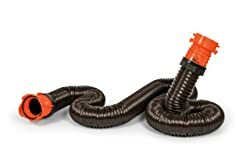 This Waste Master Sewer hose system is 20 feet, a long enough hose to offer convenience in draining your RV waste tank. I would also like to recommend the Lippert 359724 because it is designed and made with a CAM lock connector, which prevents leaks in the connection to the sewer outlet. This extension hose is also designed innovatively with its helical coil outside that adds to its toughness to meet your needs. On the inside, it is made with a smoother interior, which prevents any waste from being stuck inside it. The best RV sewer hose is UV protected and be compressed to 5 feet and 6 inches for easy storage. When extended it measures 20 feet, boasting to keep the same length as required during use. It also includes a permanently connected and molded nozzle and has an easy to grip handle. I would also like to commend that it has a built-in shutoff valve that ensures no leaks. The Lippert 359724 also has a transparent port, allowing you to see if the waste has completely been eliminated. Finally, I also appreciate that it comes with a 90-degree discharge port, which is easy to secure and fit into a sewage inlet. 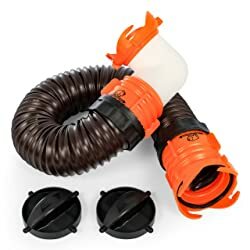 The Camco RhinoFLEX 39768 is a three feet sewer hose kit, which is easy to connect to a portable waste holding tank that can be easily attached to a lug sewer fitting. So if you have a portable waste holding tank and looking for a convenient to use hose kit, you might not to miss the model that also ensures no leaks and odor for its precise fittings, which keeps a tight connection for an odorless and secure fit. When compressed, the hose only measures 19 inches and 3 feet when extended. You can extend it to the length you desire and need when draining the portable waste holding tank. I also like the 90-degree translucent elbow that includes a bayonet swivel fitting. The Camco RhinoFLEX 39768 also includes two storage caps for sanitation and an odor-free storage. Overall, the RhinoFLEX 39768, which is made of polyolefin material, is one of the best choices for your portable tote tank that offers an odor-free and secure connection. If you’re looking for an easy to use and durable sewer hose kit, you might want to take a second look at the Thetford 1218.7853 17853. 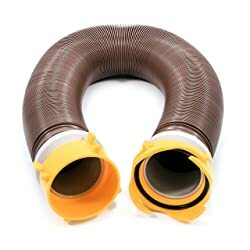 It is a versatile hose that is so easy to connect or mount on your waste outlet for quick and easy draining of waste material in the holding tank. I also saw that it comes with an extended grip universal bayonet mount, which adds to its versatility for use in applications. When it comes to design, this product is designed and made with 15ft rugged TPE hoses that are easy to connect to each other and to your outlet. I would also like to recommend the Thetford 1218.7853 17853 because it can prevent leaks. It can also prevent crushing for its sturdy TPE material that can bounce back after a car has run over it. For functionality, the sewer hose kit is also one of the best around because it can prevent abrasion and puncture. It can also deal with changing temperature. Plus, this model also has a revolving 5 in 1 adapter with a handle, which makes it easy to control and connect to the dump station. The Valterra D04-0114 might be the one you’re looking for if you’re searching for a durable and heavy-duty kit that can serve you for many years. This product has an 18-mil thickness, which can prevent abrasion, crushing, punctures and pinholes for a leak-free hose. This hose kit is also UV protected to ensure it can handle temperature changes in the campsite or remote place where you are camping. It is a reliable extension hose with 10 feet length, allowing you to extend it as needed especially when your RV is parked somehow far away from the dump station. It is also easy to use for its rotating fittings, which make it convenient to mount. Plus, the 90-degree adapter adds to the ease of maneuvering and operation of the hose kit. It is also a collapsible model that offers ease of storage, being only 25 inches in the collapsed state. Overall, it is a decent choice for RV owners looking for a durable and quality sewer hose. Keeping the RV sewer tank clean by emptying it when full or when needed is one of the basic tasks you need to fulfill if you’re an RV owner looking to keep your rig clean and your sewer free from odor. To ensure of a leak-free connection, this product comes with lug and bayonet fittings, which are easy to connect. For added convenience, it boasts 360-swivel fittings, too. The Camco 39639 is made of sturdy vinyl material that makes it long lasting even with heavy abuse and use. It is easy to extend up to 10 feet, while also keeping its shape for secure connection. This extension hose can extend the reach of your hose kit, while also having the ability to compress at only two feet that lets you to store it easily. It is also convenient to store in four inches square bumpers of your rig. There is no hassle at all when it comes to using the extension hose kit for its durability, flexibility and versatility. While there are many sewer hose kits on the market, it pays off to find one that has the features and characteristics that match our needs. For example, when selecting the best RV sewer hose, you should consider the length and diameter. That is the exact same reason we’re featuring a buying guide in the following section. Check it out. The RV sewer hose length is an essential factor to consider when finding the right sewer hose kit. For one, it matters because it will ensure that you won’t have a hard time to extend the hose to your desired length especially when you’re parked away from the dump station. For the most part, many RV hoses are long enough for this purpose. There are models reaching between 15 and 20 feet. On the other hand, if you need a longer one, there are also 10-feet extension hoses for an extended reach of your sewer hose kit. To choose the correct length, you should measure the distance from the rig’s dump outlet tube up to the vehicle’s rear, and then add a few more feet. But then, there are also parks with ground sewer connection located at the site’s rear portion – and that is something to make for a long distance. You should also take that into consideration. So generally, you might want to have several hose sections for a reserve whenever needed. Just as how important the length is, the diameter of the RV sewer hose is also essential in making a buying decision. The diameter of the hose, in general, is at three inches or four inches on the exterior. On the other hand, the inner diameter can be at three inches at the Bayonet fitting itself, at the very least. The diameter of its interior, for example, will aid in the smooth flow of the waste when it is being dumped at the station. With a good inner diameter, you can ensure that the draining will also be faster than with other products that have otherwise narrower diameter. In addition, take note that dumping stations don’t always have a level surface for a smooth and continuous flow of the waste draining. That is why you should pick a hose that has sufficient diameter especially when the sewer hose isn’t angled downwards. So overall, the diameter of the hose can make sure of a consistent flow and prevention of blockage inside. While it can be easy to store your RV water hoses after using the water station in the RV camping park, it might not be the case for a stinky sewer hose. Of course, you don’t want to have that foul smell in your rig. Or else, infection might spread and odor will cause annoyance for everyone inside the vehicle. Not all of us have a large RV to have a room for the RV sewer hose. That is why it is also important to choose an easy to store sewer hose kit. For many of the products that we’ve featured here, they can easily fit into standard bumpers. That is one thing that you have to look for when choosing the RV sewer hose kit for your vehicle. On the other hand, you might also want to opt for an extra sewer storage kit that will fit close to the dump valves. These kits contain an extra hose for convenience and reserve when needed. That is why it is important to choose the best RV sewer hose that has sufficient thickness in order to ensure it can resist abrasion, crushing and pinholes. A thick hose with ideally 23-mil thickness is what you need to ensure it can handle stress and different elements that will otherwise damage it. Overall, you should compare your options well and as much as possible find a thick sewer hose kit that can withstand heavy pressure and prevent pinholes and crushing. Another important consideration when shopping around for an RV sewer hose kit is its materials. At the very least, you will find models made of polyolefin or vinyl materials. In some of those we’ve featured above, they are made of sturdy polyolefin material, which is also reinforced with steel wire. The addition of the steel wire in sewer hoses makes them more durable because it provides a stronger frame, which also resists crushing. On the other hand, there are also models made of vinyl material. However, you must ensure that the vinyl is thick enough to handle stress and abrasion. For example, you will find some products featuring 15 mils that can be sturdy and heavy-duty enough and is ideal for RV owners that camp often. But when choosing vinyl as material, check that it has more vinyl content, or it might be fragile. Overall, choose the correct RV sewer hose material that can ensure long-lasting use. You can start selecting and weighing your options from the list that we have in today’s guide. The next thing to consider when shopping around for an RV sewer hose is its flexibility. You should look for one that is compressible and flexible at the same time. Compressibility might not do much if the sewer hose is hard to bend. What do you think? That is why you should opt for a model that is flexible so that you can easily collapse it when needed. For example, you might want to look for a sewer hose that can flex down to -30-degree F. This is one of the most important factors to consider when choosing a good RV sewer hose. If it is flexible, you can easily store it in the bumper. You can also ensure it is easier to maneuver if it can flex. Nevertheless, being flexible adds to the ease of use and convenience, not only in storage but in use, too. And for a flexible sewer hose, you can also make sure it can keep its shape even after installation. There are some hose fittings as well as a hose extension you might want to know about before making a purchase. The hose fittings must be versatile and as much as possible universal that it can fit different sizes of dump station pipes. For the RV hose extension, look for one that can be quickly attach to your sewer hose kit for additional reach. However, it must be compatible to your main sewer hose kit to ensure ease of use. But for more information about these items and accessories needed for a complete sewer hose kit, check out the following. It is one of the most important accessories to have in your sewer hose kit because it can be used in supporting or lifting the hose up especially for unlevel dumping stations. This product is also great to have because it can protect the hose from punctures and holes. One of its main roles is to keep the hose off the ground, preventing any sharp and spiky objects from puncturing the hose. In addition, this device can tilt the sewer hose to ensure that waste flowing through the pipe can also be supported. This device can also let an angle to the pipe, reaching up to 7.25 inches in some products. On the other hand, you can also select the tilting angle you want, or opt for the highest angle possible for the smoothest waste flow. 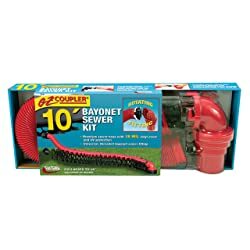 Overall, the RV sewer hose kit is easy to use and mount. You will need it for your kit for a quick waste holding tank draining. One of the RV sewer hose fittings you need for the kit is the adapter. For those products we’ve featured in this guide have a translucent elbow adapter that can be used in fitting between three and four inches dump station pipes easily and quickly. When shopping around for a new sewer hose kit, you should look for this feature to ensure you won’t have a hard time to fit it into dump station pipes so that you can be certain you can accomplish the task faster. Such adapters may also come as a 90-degree universal sewer adapter. On the other hand, there are also those that include a 5-in-1 adapter that proves to be more versatile than other models on the market are. 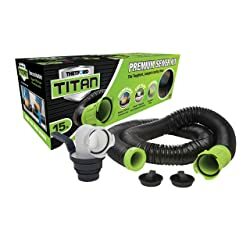 There you have what to remember when shopping around for a sewer hose adapter that can give you an easier time in connecting your hose to the dump station pipe. Again, look for a kit with an adapter to fit a certain range of dump station pipe. The RV Sewer Valve is a component of the sewer hose kit that allows wastewater and waste to flow only one way and prevent it from backing up. Many of those products we’ve reviewed today have a built-in or integrated shut off valve. It is included in the design to prevent waste from backing up. It is unique that it can prevent solids, grit and waste from entering back the RV sewer line. It is what can also prevent unwanted flow in the reverse direction. The integrated shut off valve will also prevent leakage in the connection. Overall, you should look for a sewer hose kit that is complete with accessories including a sewer valve that plays an important function in the kit. That is why you have to check on it when deciding to buy a new sewer hose kit. You can start comparing your options using our list above. When shopping around for a new sewer hose kit, you should also look into its connectors in the design. When looking for hose fittings for a sewer hose, the connectors must be easy to attach and detach for quick completion of your task. For one, you must look for one with pre-connected swivel fittings, allowing for easy attaching of the two sections and quick attaching to each end. And one more thing, you might want to find that with 360-degree fittings for easier use and quicker attachment. It might be for you if you’re looking for a more versatile connector to use for your RV sewer hose kit. The sewer hose connectors are helpful and valuable because they can make your task easier, allowing you to complete your task faster. These connectors will give you ease in operation and emptying your RV holding tank. Overall, the hose connectors should be easy to connect and disconnect and must be long lasting. What is a hose coupling? It’s a hose connector that it attached on one end in order to couple or connect with another hose. It is useful especially if you’re using different hose sections. A coupler is made of aluminum, stainless steel, brass, steel or plastic. You can choose from these materials when shopping around for a hose coupler especially if you’re using an extension hose. The coupler must be easy to connect and disconnect so that it won’t give you a hard time whenever you need to empty your RV sewer. This product will help you take advantage of ease of installation especially when trying to be in the RV camping park for a couple of days. Thus, the hose coupler must also be secure and fit to prevent any leaks. No one wants a stinky recreational vehicle, so it is necessary to use a coupler that fits perfectly. For RV owners with a septic tank at home, especially those in the rural area, they have the option of attaching the sewer hose from the RV to their home’s tank. It is easy to connect the RV to the home sewer; however, it comes with responsibility. You can use the septic cleanout where to dump the RV tank. This cleanout is a PVC pipe with a screw cap and is above the ground. You can just remove the cap, and then connect the sewer hose to the cleanout and RV. Ensure to place something heavy on the hose’s top portion if you cannot secure it to the opening of the pipe. The RV sewer hose is generally between 15 and 20 feet, which are sufficient to extend to your desired reach. Most of those products that we have featured above are 20 feet in length. But then if you want a hose extension, you can also buy an extension kit with a hose that is of 10 feet long. For those RV owners with a portable tank, they also get an extra extension hose kit that is three feet long. For some models, they are available in two hoses each with 10 feet length. They can be connected or can be used as only one section with 10 feet long. If you want to make your hose kit to become more durable, you can hard pipe them using PVC pipes as well as some flexible connectors, usually made of rubber material. You can hard pipe your sewer line in order to prevent its damage from pinholes, punctures, abrasions and scratches. Hard piping is also done to protect the hose and make it longer lasting. You can slip on the hose into the PVC pipe or rubber connector with length based on the length of your sewer hose. Overall, you won’t have a hard time to hard pipe the sewer hose in order to make it more resistant to the harshest weather conditions and tough outdoor elements in the dump station. You can permanently connect the holding tank drain to the sewer drain especially if you’re aiming to extend living in the RV camping ground. By doing so, you can save yourself time in attaching, removing and then cleaning your sewer hose when you need to empty the tank. Hooking up the sewage drain to your recreational vehicle, you can also have more convenience because you don’t have to do it manually each time you need to empty the holding tank. if you want to do it correctly, we have found a source to help on it. Check out this link for the complete directions on how to connect sewage drain to an RV permanently. Close the drain valves, and then twist off the outlet termination cap. Get the distance from the drain outlet to the inlet of the sewer. Cut the pipe based on the length you got from the measurement. You can then start slipping the flexible connector onto the outlet adapter’s hose side. Start twisting this adapter onto the drain outlet of your vehicle. Next, you can slip the PVC pipe’s cut length into the other side of the connector, and then start tightening the connector’s clamps. For complete instructions on how to perform this task, you can visit this link outlining the steps. It will be more convenient if you could hook up the RV sewer at home, because you don’t have to drain the tank manually each time it needs emptying. One of the best ways is to add a septic tank system for your vehicle, which is also the lowest maintenance option. On the other hand, you can also buy a premade septic tank. Some owners also use a self-composting toilet, which is able to eliminate black tank. What it does is separating the solids from the liquids before they leave the toilet. Here is a useful source on how to hook up your RV at home. Alternatively, you can check out this DIY for hooking an RV to a sewer line. There you have what you need to know about best RV sewer hose, its components and its workings. And for more info, you can also refer to our guide on the basic operations needed for a sewer hose kit. Hopefully, you will be able to pick the right sewer hose kit by comparing your options using our list above. Buy the right sewer hose kit based on its length, diameter and thickness, among other factors, today!